Yokohama Orange Pale Ale is a 5% fruit beer with an American Pale Ale base by Yokohama Brewery, based in Yokohama, in Kanagawa, Japan. It’s part of their local lineup that uses products from the surrounding Yokohama and Kanagawa area. 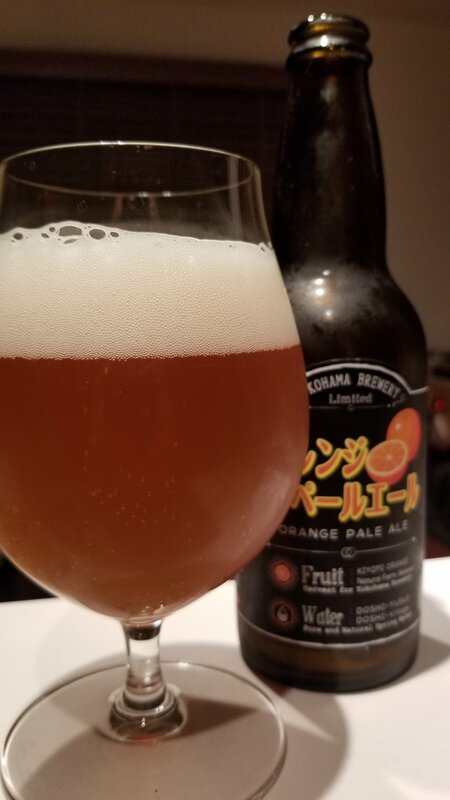 Yokohama Orange Pale Ale uses Kiyomi oranges, sourced from Odawara, and also water from Doshi village, like the Yokohama Yuzu Weizen. At the time of writing, it’s unknown whether Yokohama Orange Pale Ale is a one-off or will be repeated in the future. After the previous Yokohama Dragon Fruit Ale, Yokohama Seya no Komugi Beer, and the aforementioned Yuzu Weizen, I was looking forward to trying Yokohama Orange Pale Ale. The previous beers have been nuanced in terms of the fruit neither dominating the beer flavour or producing chemically flavours. Yokohama Orange Pale Ale poured out a hazy dark orange brown colour with a plump white head on top. There wasn’t much of an orange aroma though coming through. Yokohama Orange Pale Ale had more of a sweet biscuit nose to it instead of an expected orange twist or some hops. The body was quite smooth from beginning to end, with very little fruity tartness coming through. In fact, it taste like someone had forgotten to add in the oranges. The beers was well within its best before date, and was also relatively fresh too. It had a faint bitterness to it that was more hoppy that an orange tartness, though the biscuit malt base wasn’t powerful enough to carry this beer or bring something worth drinking. After having waited for 30 mins (I drank something else instead!) the orange still failed to materialise through. I’m disappointed with Yokohama Orange Pale Ale – maybe if it was super super fresh it may have been nice but in a bottle? Give it a miss.